Once upon a while there existed a Rajput Raja of the Chauhaan Empire, who led the empires of Delhi and Ajmer in north India thru the final partial of the 12th century. Raja Prithvee’s mother once foretold her Son that a Muslim Saint would derive in his kingdom and if he mistreated the Saint, his empire would be sacked. Astonished to overhear such words from her mouth the King was very furious and as predicted by her the forecast came to be true. The holy and sacred Hazrat Khuwaja Moin-uddin Chistie endured with his cliques on the shores of Ana-Saagar River. The cliques of the Holy-Saint drew water from it and occasionally they would fish from the river, these actions were offensive according to the opinions and divine mental state of the Hindus and the King. Surrounding the river were several temples and the priests protested about Opposing Hindu deeds to the King. Without hearing the Saints point of view the King instantly passed orders for the removal of all Muslim Saints and his cliques from the shores of Ana-Saagar. The emperor’s warriors not only call for the removal of Hazrat Khuwaja Moin-uddin and his cliques but also proudly claimed on their evacuating the Ajmer land. This notification of departing Ajmer-shareef was proclaimed in a very impolite and wrong tone. While on the other hand Hazrat Khuwaja Sahib was not willing to agree to the departure from Ajmer-shareef with his cliques since he was directly instructed and commanded by the noble Prophet and was dwelling by the will of Allah the Great Almighty. A plan was prepared by the priests to mob and attack Khuwaja sahib with the vital aim of executing him, knowing the intentions Khuwaja sahib took some sand in his hands and tossed it upon these unkind priests which withdrew them whereas some lost brains, some lost eye-sight and some ran missing in fear. Now the Gurus were on their toes desperately hiding from Khuwaja Sahib to save breathes. The Gurus rushed to narrate the incident to the cruel King and nearly reached his palace. When the King observed the situation he turned out to be very disturbed and dismayed. He instantly took a very merciless step in contrary to the situation and ordered the river to be secured as Khuwaja sahib and his cliques must not be permitted to access the water. He called the alarm and deployed his soldiers on the shores of Ana-Saagar and firmly stated “Muslims should not be permitted to fetch water from the river”. When Khuwaja sahib’s cliques arrived at the river to fetch water, they witnessed that the rivers water was completely forbidden for them and the Kings army were deployed there. The followers became very startled and reported back to Khuwaja Moin-uddin with an unfilled vessel and explained what they had witnessed. Hazrat Khuwaja Moin-uddin Chistie was very upset and personally went towards the river to fetch water and came face to face with a soldier, who disallowed him from fetching water from the river bank. 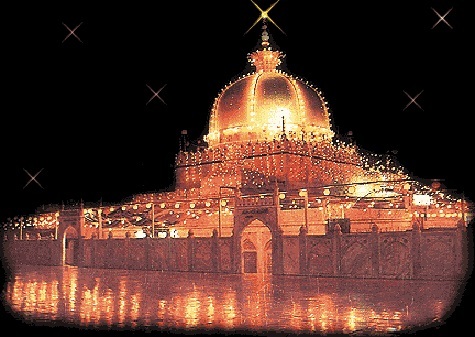 Hazrat Khuwaja Moin-uddin Chistie looked at him with his marvelous senses. The poor warrior could not repel Hazrat Khuwaja Moin-uddin’s annoyed expression and he turned out to be tense and trembled down to the earth knocked out and also released the weapon from his enormous hands. Hazrat Khuwaja Moin-uddin captivated and drew the entire water-course of the city in his beaker together with Ana-Saagar’s water too. The water-sources of the entire city strangely died out. Not just this but even the nursing mothers milk in their breasts and of even animals dried out. The great loss of water was noted by the King and his people with dismay. This marvel triggered a prodigious revolution in the opinions and spirits of the community. As a result, a great total of people embraced the holy religion Islam at the noble hands of Hazrat Khuwaja Moin-uddin Chistie. The power of the rivals to him shrunk due to his extraordinary marvels. Now It was the Kings turn to be criticized by his own general public for the loss of the rivers water. Despite of his finest hard work and policies Ana-Saagar’s water could not be reinstated. Sick and tired of the complete incident at last Prithvee-Raj-Chauhaan the so called Great-King personally paid a visit to Hazrat Khuwaja Moin-uddin Chistie and begged that in future he will never forbid the usage of the river for any human-being or living-creature, which is definitely an open reward of Mother-Nature. He made an apology to the Holy-Saint and the water facility was given back to all instantly. Decision: Dear Islamic brothers and sisters the lesson we learned from the very episode is that never disrespect the holy saints of Almighty Allah for they are the friends of Allah and they are supported by Him beyond our imagination. Our holy ancestors, together of blood and spirit and respectively of our soul’s rest definitely on the grounds of their martyr. They are very close to our souls and hearts plus, when connected with in aware habits, they are surely a great source of remedy, support and amity. So please do respect them, for because of them and their sacrifices we are born Muslims.